Merry Christmas and Happy Holidays from Lennox Head Landcare! Hope you’ve all been able to find the time to get out and enjoy our glorious piece of paradise. Big news for all you nature lovers this month - an event which we’ve been eagerly anticipating at Landcare for some time - it’s the Christmas Bells, they're out! These stunning plants rely on fire to stimulate flowering. And they haven’t really been seen in Lennox since 1996, when they flowered in great mass along the Coast Road after the last big fires. We’ve recently had a sneak peek in this same area, just north of Tobin Close - and have spied some early bloomers. Christmas Bells, so called because they have bell shaped flowers which come out around christmas time, belong to the Lily family. They have grass-like leaves and showy red and yellow flowers. There are four species of Christmas Bells in Australia, the one we have in Lennox, Blandfordia grandiflora, is the largest. The flowers stems stand up to 175cm tall - best to keep your eyes up if you’re looking for them. 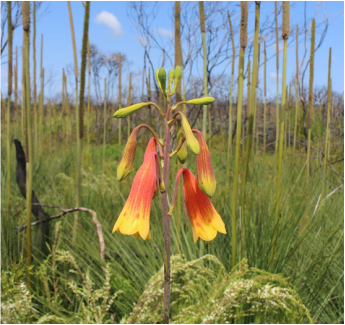 Adult Christmas Bell plants survive fire by resprouting from underground corms. They then flower in mass around December and January for 1-2 seasons after fire. After that it’s only the odd plant which produces flowers, until the next fire. This phenomenon is called ‘pulse flowering’. Since it’s now the first flowering season for Christmas Bells since our January heath fires - we’re expecting great things. The best place to look for Christmas Bells is probably along the Coast Road north of Tobin Close. You could also try taking a walk through the heathland north of Lake Ainsworth, apparently they were seen there in the old days. If you do find Christmas Bells, please don’t pick the flowers, they are a protected species. And whilst not a threatened species in NSW, unfortunately in QLD they’re listed as endangered... too many sneaky pickers! So put down your coffee, your wine, your green smoothie or whatever it is thats keeping you still and get out and see these stunning flowers, it could be a very long time before they come out again. If you’re not lucky enough to find the Christmas Bells - find something else offered by nature to admire.... learn about it.... and contemplate its awesomeness. Happy Holidays!